TaterPiks are zesty little pickled potatoes grown in the Klamath Basin by 4th generation farmers who have a passion for growing potatoes. They start with Organic Klamath Pearl™ potatoes, which are infused with a delicious brine and all-natural seasonings. 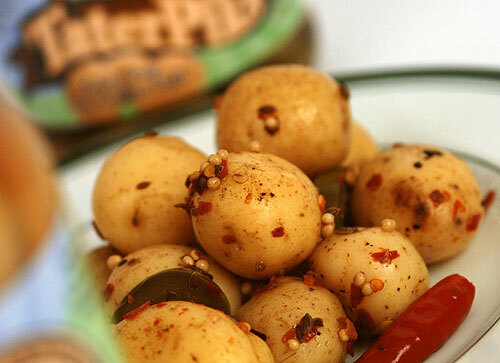 The result: TaterPiks, Gourmet Pickled Potatoes! At Rafns' we like to add TaterPiks to appetizer plates and salads. They're also a great addition to potato salads, soups, and vegetable dishes! Find recipes and more information at www.taterpiks.com.